Boston and the surrounding areas, including the City of Cambridge just across the Charles River, have come a long way in terms of promoting bike safety. Still, there is much work to be done as we look ahead to 2018. As detailed recently by CBS Boston Local, a hand-painted bike lane on the Congress Street Bridge really brings this point home. An unknown activist or group of activists created a bike lane complete with while lane divider line and bike lane logo using a can of white spray paint. As one might expect, this was makeshift bike lane was quickly photographed and tweeted as well as being posted on bike rider advocacy websites. There were a lot of jokes about the lines not being straight, but also thousands of comments about how the city needs to put in an official bike lane to prevent the many preventable bike rider injuries and fatalities that occur when such precautions are not taken. The city obviously did not approve of a non-official bike lane and promptly attempted to scrub it off the road surface. There is still some paint left, according to Twitter users, and they are attempting to use it to prove how necessary a bike lane here, and in other areas, really is. 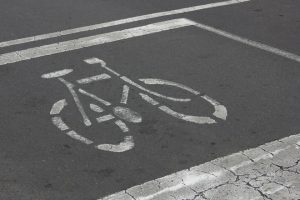 To the Department of Transportation’s credit, however, they did issue a statement expressing their understanding of the need for such bike lanes, but explained that there is a an engineering and approval process before any official bike lane can be designated. This process, they say, is in place to insure the safety of bike riders, pedestrians and motorists. As our Boston bike crash accident lawyers can explain, this bridge is used by many bike riders daily, and it is also the type of situation that can result in serious accidents. As with many other bridges, there is a narrowed roadway, virtually no shoulder or breakdown lane, and metal guardrails. When cars are speeding across the bridge, as they often do, there is nowhere for a bike rider to go avoid a collision. This is not to say the bike rider does not have the right of way, and a motor vehicle operator must observe that right for way pursuant to Massachusetts General Laws (M.G.L.) Chapter 90, Section 14, but right of way doesn’t always matter when it comes to avoiding being hit by a car. This is not to say that right of way, and more importantly, a motorist’s failure to give a bike proper right of way, cannot be used as evidence in a Boston bike crash lawsuit, but if a bike rider has the opportunity to take reasonable evasive maneuvers to avoid a major bike crash, that is the proper course of action to prevent loss of life and limb. Bike lanes can seriously prevent such accidents for a variety of reasons. A well-constructed bike lane not only provides more room for cyclists when riding on the same roadways as motor vehicles, but it also puts drivers on the lookout for bike riders, since the lane brings this need to top of their mind, or at least it should. In the best-case scenarios, a bike lane will not only be painted on the road, but also include some type of physical division between the lanes that is elevated from the road service, rather than just paint. In areas with sufficient room, a reinforced barrier such as the ubiquitous Jersey barriers can be used to protect bike riders. This is not a perfect solution, as injuries can still occur if a car or truck hits one with sufficient speed, they do work in the majority of cases. When there is not sufficient room for a permanent barrier, breakaway PVC poles can be installed and drivers will typically stay clear of them. They can also offer some protection by using what are known as cats’ eyes, which are the metal devices put on the lane lines with reflectors to make tires bump when they are run over by a car. This is actually being studied across the globe. Canada has made major strides in certain cities and provinces in reducing the total number of bike rider injuries and fatalities. One of the main ways they did was by what they call cycle paths. A cycle path is the type of bike lane discussed above where there is a physically protected lane for bike riders to prevent riders from being involved in bike-car crashes. The University of British Columbia (UBC) has conducted extensive research on this issue and has found that in Vancouver, bike lanes that are not protected are 50 percent more likely to the be the site of a bike crash in which a rider is seen in an emergency room than when bikes are operating on a designated cycle path. While it is generally accepted wisdom that these designated bike lanes, or cycle paths are they are sometimes called are much safer than not having them, there is still a great deal of pushback from those who do not ride bikes. One of the main reasons the non-biking public does not like them is because they often result in a reduction in the number of travel lanes designated for motor vehicles. This, in turn, results in slower moving traffic. There is also the issue of cost. It would be nice if roadways could be expanded, but that is generally not feasible in cities like Boston. As bike safety advocates point out, the cost of not having designated bike lanes, preferably with physical barriers, is too high. First, there is the cost of human lives and pain and suffering. While this can be addressed in a Boston bike accident lawsuit, any loss of life or personal injury that could be prevented is too great. There is also the cost in terms of dollars in hospital visits and medical care, as well as police involvement and accident investigations. These costs should be considered, as well, in any detailed analysis. If you or someone you love has been injured in a Boston bicycle accident (we prefer the term “crash”), call for a free and confidential appointment at 1-888-789 BIKE (2453).